The expansion of monasticism was the main force behind the unprecedented artistic and cultural activity of the eleventh and twelfth century. New orders were founded, such as the Cistercian, Cluniac, and Carthusian, and monasteries were established throughout Europe. Writing in the early eleventh century, the Burgundian historian Radulfus Glaber described a "white mantle of churches" rising over "all the earth." Stimulated by economic prosperity, relative political stability, and an increase in population, this building boom continued over the next two centuries. 20th-Century World Architecture portrays, for the first time, an overview of the finest built architecture from around the world completed between 1900 and 1999. The unprecedented global scope of this collection of over 750 key buildings juxtaposes architectural icons with regional masterpieces.Specially designed and commissioned graphics at the start of the atlas explore the changing economic and political contexts of architectural production throughout this fascinating century, and highlight the flow of architectural ideas and architects around the globe. The selection of projects brilliantly illustrates the built outcomes of these formal and cultural influences in every corner of the world, with some surprising revelations. Divided into six world regions and 29 sub-regions, over 80 countries are represented. The collection is the result of a rigorous selection process and the input of more than 150 specialists from around the world, ensuring that each region has benefited from expert advice. An independent banknote designer based in Berlin, Reinhold Gerstetter, was selected to refresh the design of the euro banknotes.Dominant colours will be used for each note and they will contrast with the "adjacent" notes in respect of their value. Each banknote denomination in the second series will have the same colour as in the first series, i.e. grey for €5, red for €10, blue for €20, orange for €50, green for €100, yellow-brown for €200and purple for €500 . 24 Seventy weeks are determined upon thy people(ISRAEL) and upon thy(ISRAELS) holy city,(JERUSALEM) to finish the transgression, and to make an end of sins, and to make reconciliation for iniquity, and to bring in everlasting righteousness, and to seal up the vision and prophecy, and to anoint the most Holy. (JESUS ANNOINTED WITH HOLY OIL AS KING OF JERUSALEM FOREVER). 26 And after threescore (60) and two weeks (2) shall Messiah be cut off, but not for himself: and the people of the prince that shall come shall destroy the city and the sanctuary;(AD 70 IT WAS THE ROMANS OR EU OF TODAY THAT DESTROYED THE 2ND TEMPLE) and the end thereof shall be with a flood, and unto the end of the war desolations are determined. 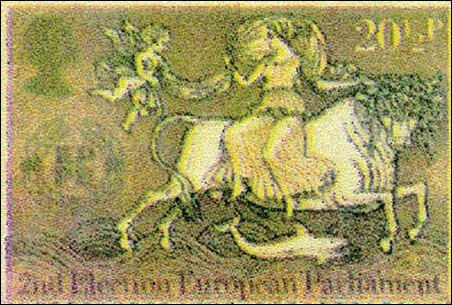 Berlin - The European Central Bank (ECB) will start circulating a new 10-euro banknote from 23 September,(2014) ECB board member Yves Mersch told press on Monday (13 January).It will be more colourful than its predecessor and is designed to have a more easily recognisable figure 10. It also contains extra security features on both sides to make life harder for counterfeiters. "It certainly resembles the 10 euro notes you have in your pockets, with its [images of] distinctive Romanesque architecture. 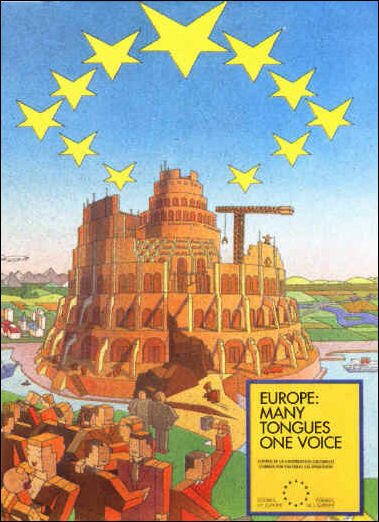 However, perhaps it will have more of a visual impact, as the images are larger and more defined, the colours are stronger and the bridge has added depth," Mersch said.The ECB last year launched a new five-euro bill which features a hologram of Europa, a mythological princess symbolising the origins of Europe.The new 10 euro bill is the second in the “Europa” series. "The five euro and 10 euro notes are not always treated kindly. By protecting them better, we can prolong their service life and reduce their environmental impact," Mersch added. Mersch replied: "It's also being said that criminals like big German cars. This is still no reason to forbid the production of such cars.”He added: “We [have] repeatedly explained to the European Parliament why we are keeping the €500 note and will continue to do so." 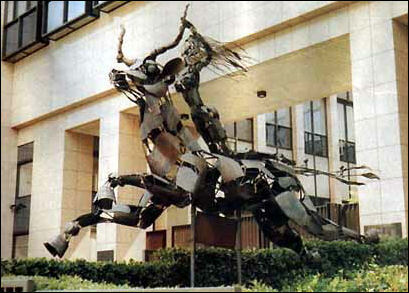 BRUSSELS - In Greek mythology, the Phoenician princess Europa was abducted and raped by the king of the gods, Zeus.But her image will from next year appear alongside pictures of windows and doors on euro banknotes as a security and decorative feature. "Portraits have long been used in banknotes around the world and research has shown that people tend to remember faces. 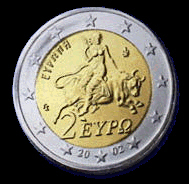 Is there any better figure than Europa to serve as the new face of the euro?" the chief of the European Central Bank (ECB), Mario Draghi, said on Thursday (8 November) according to Bloomberg.She will first appear on the €5 note in May, with other notes introduced in ascending order in the next few years.Europa's face will be shown as a watermark and as a hologram. Until now, euro notes carried pictures of windows and doors in various architectural styles in a symbol of openness designed not to offend national sensibilities.The new notes will also carry an emerald-coloured number.The first series of banknotes will circulate alongside the old ones. But the old notes, first introduced 10 years ago, will eventually cease to be legal tender. "The date when this occurs will be announced well in advance," the ECB said.The old notes will retain their face value and will be exchangeable at any national central bank in the eurozone even when they are no longer valid in shops.Meanwhile, counterfeiting euro notes has kept international law enforcement authorities busy.In April, an international police sting in Bogota, Colombia dismantled a counterfeit print shop and depot manufacturing €50 and €100 bills.Europol, the EU’s police agency, based in The Hague, said authorities seized over €19 million in counterfeit money in Columbia alone since 2006. 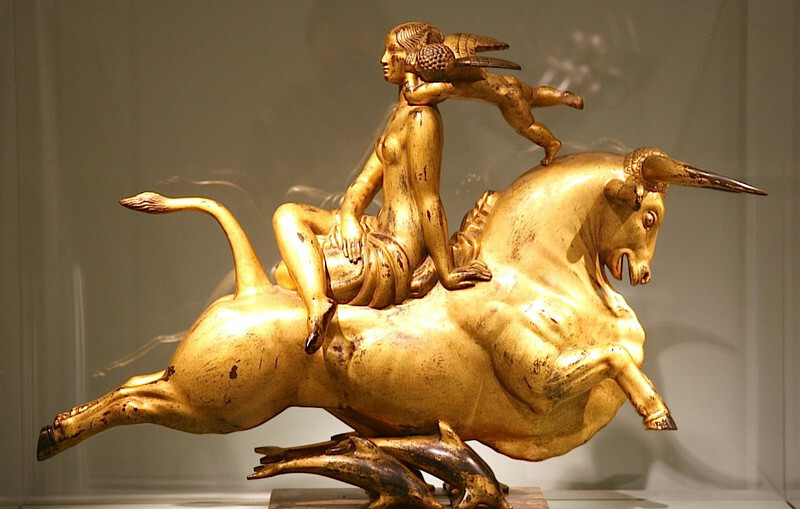 — A WOMAN RIDING A BEAST! BRUSSELS - EU countries have provisionally agreed to send troops to Bangui airport to protect civilians and distribute aid.An EU source told EUobserver that member states' ambassadors on the Political and Security Committee "unanimously" endorsed the proposal at a meeting in Brussels on Friday (10 January). The final decision is to be taken by foreign ministers on 20 January.Details on the composition and mandate of the "battalion"-sized force will be worked out in the next few weeks.Another EU diplomat told this website the ambassadors voiced "overwhelming support" for the need to intervene in the "awful" sectarian conflict and to "show solidarity" with France, the former colonial power in the Central African Republic (CAR), which has already deployed troops under a UN Security Council mandate.Some 100,000 refugees are currently taking shelter at Bangui airport under French protection.The initial proposals included an alternative option - to send the EU force to patrol roads from CAR to neighbouring Cameroon.But French President Francois Hollande voiced preference for the airport mission at the last EU summit in December. A third EU contact said the airport operation is considered to be "safer" and "more easy to execute successfully" than setting up roving patrols on the Cameroon access points.The conflict erupted in 2012, but escalated last year when rebels entered the capital.Christian-Muslim clashes are said to have claimed more than 1,000 lives and displaced almost 1 million people in the past few months alone.CAR is a mineral-rich state, which hosts uranium mining investments by French firm Areva. Raffaele Buscemi Rome Either it’s Google giving Francis a wink or a hacker thought of a fun way to show their support for the Holy Father, or maybe Google’s putting Francis forward as a candidate for the Nobel Peace Prize. Those who have spotted the interesting anomaly on Google Translate have been coming up with all sorts of theories to explain it. But what is it all about you may be asking. 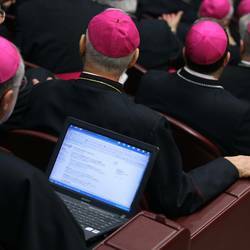 Well, go to Google Translate, select Italian as the source language and type in “Bergoglio”. The Pope’s surname translates as “better world” in any target language you choose.I tested this out myself and here are the results Google Translate came up with in some of the target languages I selected: Latin: mundo melius; Hungarian: jobb vilag; Basque: mundo hobea; Portuguese: mundo melhor; Spanish: mundo mejor; Esperanto: bona mondo; English: better world. In German, French, Romanian and Greek, the translation given is in English. “better world”. It makes no difference whether you type “bergoglio” in lower or upper case.It’s hard to explain this little number and even Google Italy seems clueless as to who is responsible. All you can do is test it out for yourself and form your own opinion (however fantastical it may be!). Seeing is believing. Andrea Tornielli vatican city Francis has sent a letter to the 19 new cardinals whose nominations he announced yesterday: “A cardinal’s role requires a broader vision and an even greater heart, it requires humility. Celebrations must be sober and simple.”After announcing his new cardinal nominations at yesterday’s Angelus, Pope Francis put pen to paper and wrote a brief but important letter to each of the 19 cardinals, underlining the fact that their new role is not a promotion or an honour, it is about lowering themselves and giving humble service. None of the appointed individuals were informed about their nominations. Most of them found out when they turned the television on. 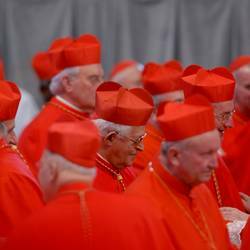 gerard o'connell rome Pope Francis sprung some big surprises today when he announced the names of the 19 new cardinals that he will create on 22 February. They come from fifteen countries, including some of the poorest countries in the world, and all five continents.Sixteen are cardinal electors with a right to vote in a conclave, among them are 6 Europeans (including 4 Italians), 5 Latin Americans, 2 Africans, 2 Asians and 1 North American (from Canada). Significantly, twelve of are residential bishops that currently govern a diocese. The other 3 cardinals are over the age of 80 and so cannot vote in a conclave.Five notable hallmarks distinguish this first batch of cardinals named by the Argentinean Pope, including universality, attention to the peripheries of the world, and a break with the tradition of giving the red hat to the heads of 8 major Italian dioceses. Universality is the first hallmark. The 16 new cardinal electors come from all five continents: 6 from Europe, 5 from Latin and Central America, 2 from Asia, 2 from Africa, and 1 from North America (Canada).The second hallmark is a distinguishing aspect of this pontificate: attention to countries and peoples on the peripheries of the world that suffer from poverty, diseases, violence, natural disasters, and for whom life is a daily struggles 5 of the new cardinals (including 4 electors) come from Haiti, the Antilles, Burkina Faso, Ivory Coast, the Philippines. Haiti is one of the poorest countries in the Americas, often hit by violence and natural disaster. Nicaragua is also among the poorest countries in the Americas, and struggling with political tensions. The Antilles are islands in the Caribbean, where so many live on the bare minimum. Burkina Faso is one of the poorest countries in Africa. The Ivory Coast has been plagued by civil war, internal strife and much poverty. The Philippines suffers from widespread poverty, natural disasters and the conflict in Mindanao. Both Haiti and the Antilles have never had a cardinal before.Another particularly striking aspect is the Pope’s decision to break with the tradition that the heads of the nine major Italian dioceses should be cardinals. Since the Lateran Pacts in 1929, it was customary to assign red hats to the archbishops of nine major Italian sees beginning with Rome and, in descending order by reason of the number of faithful, Milan, Turin, Naples, Palermo, Bologna, Florence, Genoa, and Venice. That is no longer the case.Pope Francis by-passed Turin and Venice, and gave a red hat instead to the archbishop of Perugia, Gualtiero Bassetti, vice president of the Italian bishop’s conference, a pastoral, meek and prayerful man, the qualities the Pope likes in a bishop. It’s interesting to note that the last archbishop of Perugia to be given a red hat was Gioacchino Pecci, the future Pope Leo XIII, in 1853.A fourth significant feature is that Pope Francis has kept the new European electors to a minimum. 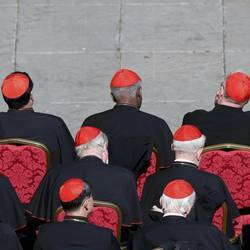 Four hold senior positions in the Roman Curia and will receive the red hat: Parolin (Italy) – the Secretary of State; Baldisseri (Italy) - Secretary General of the Synod of Bishops, a body the Pope wants to strengthen with a view to developing synodality in the Church; Muller (Germany) – the Prefect of the Congregation for the Doctrine of the Faith, a man that is very close to Benedict XVI who appointed him to this post in July 2012; Stella (Italy) –the Prefect of the Congregation for Clergy.In this context, the choice of the two other European electors stands out: Nichols of Westminster (England) and Bassetti of Perugia (Italy), both of whom he appointed to the Congregation for Bishops earlier in the month.The fifth significant aspect of the list is that the Pope did not give a red hat to any of the Presidents of the Pontifical Councils as had been the practice in recent decades, nor did he give one to the Prefect of the Vatican Library and Archives. In this way he is diminishing future expectations in the Roman Curia, and putting a curb on careerism.It came as no surprise that the Argentinean Pope gave five red hats to Latin and Central America, where more than 40% of the Catholics of the world live. As expected he gave one to his successor in Buenos Aires, Mario Poli, and to the archbishop of Rio de Janeiro, Orani Joao Tempesta who hosted the World Youth Day last year. He also recognized the archbishop of Santiago del Chile, Ricardo Ezzati Andrello, and the archbishop of Managua, Leopol Brenes Solorzano. But he surprised again by naming as cardinal, Chibly Langois, the bishop of Les Cayes and President of the Haitian Bishops’ Conference.The only new cardinal elector in North America will be Gerald Cyprien La Croix, the archbishop of Quebec. It would seem that Francis did not create any new elector in the United States because like Italy, though to a lesser extent, the USA has already a disproportionate number of electors (11) in proportion to the size of its Catholic population (7% of the world’s Catholics),even more than Brazil (5). Italy has gained cardinal electors in this consistory mainly due to the fact that Italians have key positions in the Roman Curia, but its number is destined to decrease even this year. In Asia the Pope gave red hats to key archbishops in the Philippines and South Korea. In the Philippines, the most populous Catholic country of Asia, the Pope sprung a surprise by naming as cardinal Orlando Beltran Quevedo, the archbishop of Cotabato. He is leader in an area that is a melting pot of Christians and Muslims, a respected peace advocate and knowledgeable observer of the conflict ridden situation in Mindanao, and former Secretary General of the Federation of Asian Bishops Conferences.In South Korean he recognized the Archbishop of Seoul, Andrew Yeom Soo jung, descendant of a Korean martyr and leader of a flourishing and vibrant Church, as well as apostolic administrator of Pyongyang in this divided country.In Africa, the Jesuit Pope chose the leading archbishops of Burkina Faso and the Ivory Coast: Philippe Ouédrago, archbishop of Ouagadougou, and Jean-Pierre Kutwa, archbishop of Abidjan, both sees had cardinals before.rior to his announcement on Sunday, 12 January, there had been much speculation in Rome that Pope Francis would increase the membership of the college of cardinal electors from the present number of 120, established by Paul VI, to 130 or more, but he decided not to do so. This left him with 14 red hats to assign on February 22 – the actual number of vacancies in the college of cardinal electors on that day. But aware that 2 more cardinals would reach the age of 80 before the end of May, he decided to take that into account too, and raised the number to 16.As a result of his decision, the College of Cardinal Electors will have 122 members on 22 February, composed as follows: Europeans 59 (Italians 29), Latin Americans 19, North Americans 15, Africans 13, Asians 13, and Oceania 1. But the number of Europeans will drop to 56 (Italians to 26) on May 28.By comparison, 115 cardinal electors participated in the March 2013 conclave that elected Pope Francis: 60 Europeans, 19 Latin Americans, 14 Americans, 11 Africans, 10 Asians and 1 from Oceania. 1. Pietro Parolin (Italy), the Secretary of State. 2. Lorenzo Baldisseri (Italy), Secretary General of the Synod of Bishops. 3. Gerhard Muller (Germany), Prefect of the Congregation for the Doctrine of the Faith. 4. Benjamin Stella, (Italy), Prefect of the Congregation for Clergy. 5. Vincent Nichols, archbishop of Westminster (England). 6. Leopol Brenes Solorzano, archbishop of Managua (Nicaragua). 7. Gerald Cyprien La Croix, archbishop of Quebec (Canada). 9. Orani Joao Tempesta, archbishop of Sao Sebastiao do Rio de Janeiro (Brazil). 10. Gualtiero Bassetti, archbishop of Perugia-Citta’ della Pieve (Italy). 14. Philippe Ouédrago, archbishop of Ouagadougou (Burkina Faso). 15. Orlando B. Quevedo, archbishop of Cotabato (Philippines). 17. Loris Capovilla, titular archbishop of Mesembria (Italy). 18. Fernando Sebastian Aguillar, emeritus archbishop of Pamplona (Spain). 19. Kelvin Felix, emeritus archbishop of Castries (the Antilles).